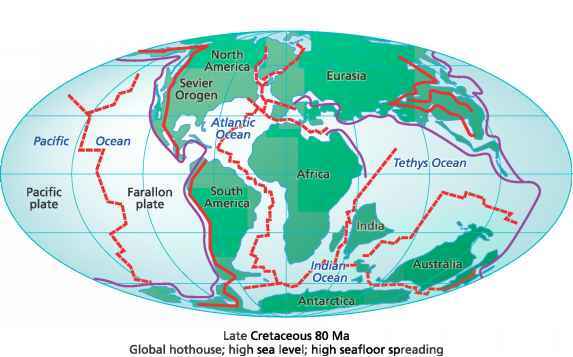 Source: Peterson (1976) and Demerjian et al. (1980). 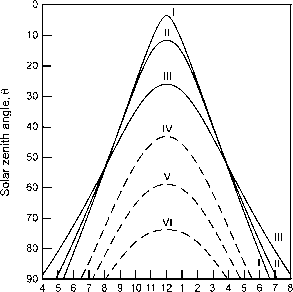 FIGURE 3.22 Effect of latitude on solar zenith angle. On the scale of true solar time, also called apparent solar time and apparent local solar time, the sun crosses the meridian at noon. The latitudes and seasons represented are as follows: I, 20°N latitude, summer solstice; II, 35°N latitude, summer solstice; III, 50°N latitude, summer solstice; IV, 20°N latitude, winter solstice; V, 35°N latitude, winter solstice; VI, 50°N latitude, winter solstice (from Leighton, 1961). including surface reflection (i.e., albedo) and the concentrations of ozone and particulate matter, which scatter and/or absorb light. (1) Surface albedo In Table 3.11 the calculated actinic fluxes are given for a surface albedo of 80%, which might correspond to the situation over snow, for example. As expected, the higher surface reflectivity leads to substantially higher actinic fluxes and hence enhanced photochemistry (see Problem 11). 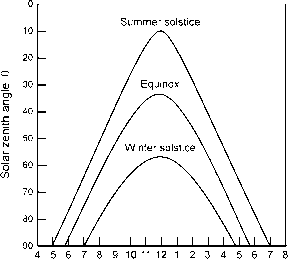 FIGURE 3.23 Relation between solar zenith angle and time of day at Los Angeles, California (from Leighton, 1961). a.m. Pacific Standard Time p.m.
(2) Total column ozone Since 03 absorbs light primarily in the near-ultraviolet, a change in its concentration will have the greatest effect in this wavelength region. Table 3.12 shows the calculated percentage increase in actinic flux at the earth's surface for a 5% decrease in total column ozone (Madronich, 1998). Clearly, the UV flux is quite sensitive to changes in the 03 concentration, with the greatest changes occurring at shorter wavelengths where the 03 absorption cross sections are increasing sharply (see Chapter 4.B). This is particularly important since the total column abundance of 03 can change by f0% or more within a season or latitude belt. In addition, decreases in stratospheric ozone due to chlorofluorocarbons (see Chapters 12 and 13) will impact the actinic flux and hence the photochemistry at the earth's surface. TABLE 3.f0 Percentage Increase in the Calculated Actinic Flux at a Surface Elevation of 1.5 km Using Best Estimate Albedos as a Function of Solar Zenith Angle and Selected Wavelengths"